Andrew Williamson / Courtesy of Choir! Choir! Choir! Two years ago this week at the first women's march on the National Mall amid a sea of pink pussyhats, a song suddenly went from speaking for one to speaking for many. CHOIR! CHOIR! CHOIR! : (Singing) I have to do this. I can't keep quiet, no, no, no. SHAPIRO: "Quiet" by the artist MILCK - that's M-I-L-C-K. It's being sung here by the Canadian group Choir! Choir! Choir! The tune became a rallying cry for women around the world who were tired of keeping quiet about sexual harassment and abuse. For our series American Anthem, NPR's Elizabeth Blair reports on how "Quiet" became a global phenomenon. MILCK: (Singing) They may see that monster. They may run away. But I have to do this. I can't keep quiet. BLAIR: MILCK says she always views "Quiet" as her personal therapy song. Then the 2016 presidential election happened. MILCK: You know, the rhetoric that was used to describe women really enraged me and just kind of brought me back to those feelings of when I was younger and I was told I need to sit properly and I need to speak less and smile more and lose weight and just be this perfect little girl. BLAIR: She says she channeled her rage with an idea. Teach quiet to other singers, and perform it at the women's march the day after President Trump's inauguration. MILCK lives in Los Angeles, so about a month before the march, she recruited a cappella singers in D.C. to perform it with her. 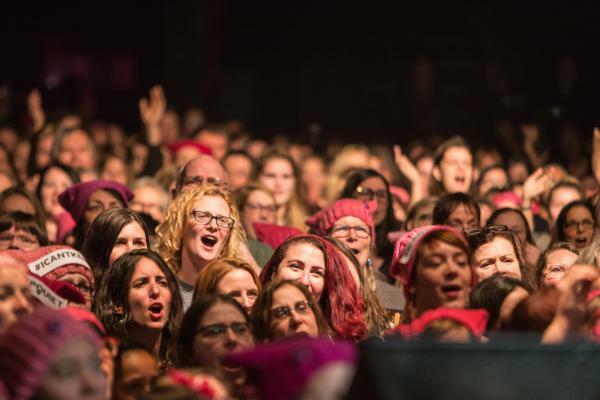 After lots of emailing and Skyping to learn the song and some in-person rehearsing, she and 26 other women put on their winter coats and pink hats and headed to the march. MILCK AND UNIDENTIFIED SINGERS: (Singing) 'Cause no one knows me. No one ever will if I don't say something, take that dry blue pill. O'ROURKE: And then we would look at each other and - started crying. And it was all just so emotionally charged. ALMA HAR'EL: This was one of those moments that I think - everybody that was around just felt something very extraordinary is happening. BLAIR: Now, remember; the women's march of 2017 was several months before the #MeToo movement hit the mainstream. Har'el says MILCK's song was exactly what was needed at the time. BLAIR: There were flashmob performances, including one in Sweden that attracted hundreds to the Stockholm train station. UNIDENTIFIED SINGERS #1: (Singing) I can't keep quiet, no, no, no. BLAIR: And a group of women in Ghana standing in a circle, facing each other, sing "Quiet" like it's the release they've been waiting for. UNIDENTIFIED SINGERS #2: (Singing) I can't keep quiet for anyone, no, not anymore. LOVE NYAABA: For the most part, we are told to keep quiet, and make it work.